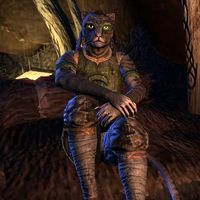 Badali is a Khajiit skooma dealer found in Elden Root Outlaws Refuge. You can find her quietly sitting in a tent at the bottom of the stairs. "'The best skooma in Bruma,' they used to day. But what does reputation matter now that pirates attacked Haven? This one bets five bottles of her best product that those filthy butchers slaughtered half our clientele!" "Pirates in Haven. Pirates! Months of delicate negotiations, cultivating contacts, and finding a workable distribution chain. All of it up in smoke because of thrice-damned pirates!" This page was last modified on 17 June 2018, at 00:12.